Power quality specialist REO UK has launched the REOTRON MDW 700 WK, a three-phase power controller with water-cooling for industrial applications. 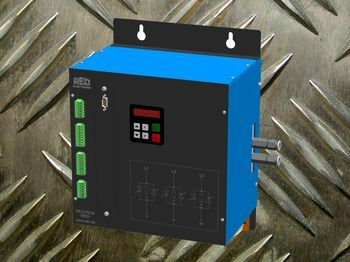 The controller offers a compact, low maintenance power solution to electrical engineers, making it ideal for industrial ovens and heating equipment in the process, automation and plating industries. The REOTRON MDW 700 WK offers reliable regulation of current, power and voltage as well as integrated current and voltage monitoring from absolute zero to 10V. The module can be easily switched between two modes — three phase-angle, ideal for controlling ripple sensitive electrical loads, and burst-fire up to 3 x 450A, better suited to applications that require low radio frequency interference (RFI). In order to extend the lifespan of the controller itself, the REOTRON MDW 700 WK is available with water cooling. In using a liquid coolant in place of air cooling fans, the device is more compact and reduces the risk of corrosive or harmful particles entering the housing and damaging internal components. “There has historically been a sense of apprehension towards using water-cooled electrical power controllers,” explained Steve Hughes, managing director of REO UK. “However, these coolants offer a range of advantages over traditional air-cooling designs, both in terms of device longevity and convenience. Not only does the more compact design make the controller suitable for a wider variety of applications, the water-cooling eliminates the need for frequent maintenance of fan filters. Engineers can also use the water from the REOTRON cooling system in other processes. This allows businesses to make the most of resources and take a more sustainable approach to plant management. The device is also available in an air-cooled model, the REOTRON MDW 700, for companies that prefer fan usage. Both models offer a number of fieldbus connectivity options, including DeviceNet, EtherCAT, Profinet and Profibus-DP. Engineers interested in the REOTRON MDW 700 can contact a REO UK sales representative on 01588 673 411.